Qualcomm’s Snapdragon 810 might be the talk of the town thanks to its status as the company’s newest flagship chip (and those overheating rumours) but the company hasn’t forgotten about the lower powered chips powering much of the mid-range smartphone segment. Just ahead of Mobile World Congress, Qualcomm has announced four new processors designed for mid-range phones. These represent the newest additions to the Snapdragon 600 and Snapdragon 400 families. They’re also where we see some of the high-end features of Qualcomm’s top-end Snapdragon 800 chips trickle down to the lower end. For example, today’s newly announced Snapdragon 425 and Snapdragon 415 (both 64-bit) are the first octa-core CPUs in the Snapdragon 400 family. The former packs the new X8 LTE modem while the latter uses Qualcomm’s CAT 4 X5 LTE modem, which is capable of up to 150 Mbps down /50 Mbps up. 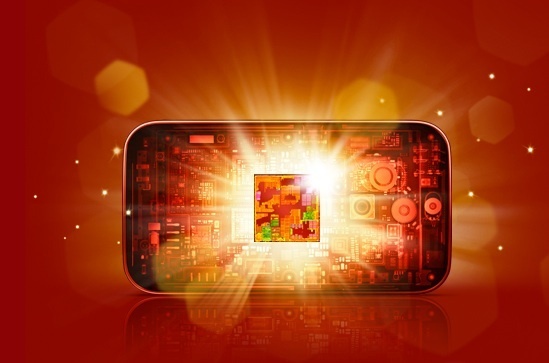 The Snapdragon 415 packs a maximum clock speed of 1.4 GHz while the 420 maxes out at 1.75 GHz. The Snapdragon 618 and the Snapdragon 620 are hexa-core and octa-core respectively. Both are 64-bit chips powered by Cortex A-72 CPUs and the new X8 LTE modem, which is a CAT 7 modem with LTE Advanced 2×20 MHz Carrier Aggregation (downlink and uplink) and support for up to 300 Mbps down/100 Mbps up. Both chips max out at 1.8 GHz. Interestingly, while Qualcomm specifies that both of the new 400 series SoCs will feature Adreno 405 graphics, the GPUs in the newest 600 series chips are referred to as ‘next generation Adreno’ and nothing more. Interesting. The fact that we’re seeing features previously only possible in the 800 series means we’re in for a very exciting year for entry-level and mid-range handsets. With MWC just around the corner, the majority of headlines are focusing on high-end handsets debuting at the show. However, there is always a raft of mid-range phones and the timing of today’s announcement from Qualcomm could indicate new phones powered by the 425, the 415, the 618 and the 625.